Recently I became particularly sensitive to discussions that address ‘meaning’ as an emergent property of both biological and formal systems (of which mathematics is one). And this is because it is the meaning of symbols in mathematics that is the source of its power. But it is not at all clear that the meaning of mathematical symbols is purely the meaning that we attribute to them. Meaning is not just assigned to mathematical symbols. It seems that meaning also emerges from them. Meaning, in contrast to information, is not an intrinsic property of an entity (a word or a molecule, for example); the meaning of an entity emerges from the interactions of the test entity (the word or molecule) with other entities (for example, words move people, and molecules interact with their receptors, ligands, enzymes, etc.). Interactions mark all manifestations of biological structure—molecular through social. Meaning can thus be viewed as the impact of information—what a word means is how people use it; what a molecule means is how the organism uses it; what an organism means is what it does to others and how others respond to it; and so on over the scales life—meaning is generated by interaction. As last month’s post explained, the ideas expressed in this article are linked to the work of biophysicist and philosopher Henri Atlan. Much of Atlan’s work is directed at understanding the mechanisms of self-organization in systems that are not goal oriented from the outside. Instead, these systems organize themselves in such a way that the meaning of information emerges from the dynamics of the system. These ideas brought Douglas Hofstadter’s famous text, Gödel, Escher, Bach, to mind again. Hofstadter spends a significant amount of time asking questions about the location of meaning in order to establish “the universality of at least some messages,” or some information. Meaning, he argues, is an inherent property of a message, if the context that gives it meaning is so natural that it is part of the universal scheme of things. Or, it’s so natural, that it’s everywhere. It turns out that locating meaning is not a simple matter. In the case of a vinyl recording, for example, we can ask whether the meaning is in the grooves of the record, or in the sound waves produced by the needle on the grooves, in the brain of the listener, or in what the listener has learned about music? In mathematics, is the meaning of symbols coming from chains of human experiences – like collecting and sorting – that are linked by metaphors? Or is it coming from the way relations among abstract objects mirror cognitive processes. Or, is it coming from our immersion in the universal properties that they express? Mathematics could look like a game, where the rules are made to establish relations among symbols. To an untrained eye, it all looks fairly arbitrary. But it’s not. And locating its meaning is, perhaps, the way we understand how it is not a game. This is important to our understanding ourselves. …the key is not the stuff out of which brains are made, but the patterns that can come to exist inside the stuff of a brain. This is a liberating shift, because it allows one to move to a different level of considering what brains are: as media that support complex patterns that mirror, albeit far from perfectly, the world, of which, needless to say, those brains are themselves denizens – and it is in the inevitable self-mirroring that arises, however impartial or imperfect it may be, that the strange loops of consciousness start to swirl. …a kind of churning, swarming activity in which thousands (if not millions) of microscopic and myopic entities carry out tiny “subcognitive” acts all at the same time, not knowing of each other’s existence, and often contradicting each other and working at cross-purposes. Out of such a random hubbub comes a kind of collective behavior in which connections are made at many levels of sophistication, and larger and larger perceptual structures are gradually built up under the guidance of “pressures” that have been evoked by the situation. By treating words such as “POINT” and “LINE” as if they had only the meaning instilled in them by the propositions in which they occur, we take a step toward the complete formalization of geometry. This opens many doors to understanding, not the least of which are the non-Euclidean geometries. 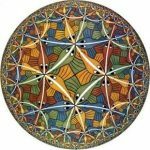 Gödel, Escher, Bach uses mathematics to address the emergence of the self-reflective ‘I’ in our experience, and Gödel’s theorems are at the heart of the matter. The fact that Gödel’s numbering made it possible for mathematics to make a statement about itself was Hofstadter’s inspiration for Gödel, Escher, Bach and the research efforts that followed. It always looked to me like mathematics was alive. I just find more and more reasons to think I was right. This is very good to hear. Thanks. Really enjoyed this post. Great reflection on G, E, B and a whole stew (slew?) of connections to enjoy. I’d love to do a study on the book someday with a group of colleagues or students.